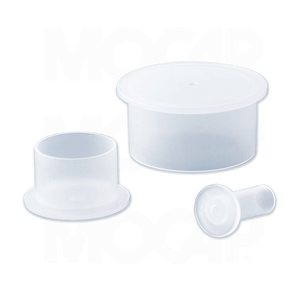 MOCAP FCM Series of flanged polyethylene plastic caps are designed to protect metric threads with and without o-rings. Flanged caps for standard metric threads are easy to assemble or remove by hand or automated equipment. The natural color of the flanged plastic caps allows visual verification of the threads or o-ring. FCM Series available in sizes to fit M5 through M33 metric threads. Additional series available to fit Standard Straight Threads and BSP & NPT Threads. MOCAP stocks Flanged Plastic Caps for Metric Threads in many sizes for immediate shipment.